Would you like to be living a happier life? 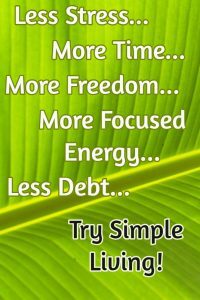 Many people are finding that as we live simply, we feel better. The organizing principles of simplicity and sustainability help us to make good choices for ourselves and for the larger world. Since simple living ends up being pretty much the same thing as simple green living, I use both terms interchangeably, here and around the site. Stress has all sorts of health implications, and you can probably list several ways that stress affects you. Poor sleep or not enough? Shallow breathing? What else? What can you do to diminish the stress you feel? Yes, even in this often crazy world we live in! You have to live on this twenty-four hours of daily time. Out of it you have to spin health, pleasure, money, content, respect, and the evolution of your immortal soul. Its right use, its most effective use, is a matter of the highest urgency and of the most thrilling actuality. All depends on that. Your happiness—the elusive prize that you are all clutching for, my friends!—depends on that. That’s from his book How to Live on 24 Hours a Day. It’s free here. I have read and re-read it. You were going to do this but then what about that? And the other things you think you should be doing? When you try to take on too much, you are trapped in all those expectations. When you begin to release the heaps of burdens that you carry in overworking, overspending, and overextending yourself, you may suddenly notice that actually you have more freedom. As the saying goes, you can do less and be more. If your mind isn’t rattling around on a gazillion things, you can concentrate your attention more on what really matters to you. That could be writing (as it is for me), athletics, family, lifelong learning, or hobbies. When I watch figure skaters or tennis players on television, I’m often inspired by how focused their energy is on their sport. Decluttering your mind gives you much more of an option to go for what you care about. If you’re not sure what you care the most about, try several things and notice which energizes you. If you are raising children, you may laugh at the idea of having focused energy. There are so many facets to this complex activity! But even in this multi-dimensional set of demands, focusing is a way to enjoy it the most and be the most effective. Sales pitches are all around us, and their key point is that we will be happier, in one way or another, if we buy their products. We are so bombarded by these messages that they become like the air we breathe. We resist some of the sales gimmicks, but it’s easy not to notice the overall urgency, that we should spend, spend, spend. If simple green living is a guiding principle in our lives, then we’ll be less tempted to gauge our happiness by our purchases. We’ll be having too much fun doing what we care about… we might even enjoy clearing out our closets and giving some things away! This site is over ten years old, and most of the articles have been about topics that would help you live a simpler, more ecological lifestyle. I’m not a total minimalist. I am fascinated by numerous books, practical kitchen devices, attractive clothing, garden tools, and other useful items. But I do careful research before I buy something, and I share my processes with you here. Having been a librarian helps me with the research, too. A good part of my wardrobe is over ten years old, some of it much older. In general, I go for things that are made to last. Simple Green Living in an Erratic World? With storms, erratic climate, forest fires, and politics all providing plenty of drama, I encourage you to keep all your household basics on hand, plus some cash. What items would you not want to run out of if the power was out for a while, for example? Reading Ted Koppel’s recent book Lights Out! (link to my review of it) was a reminder to me and to many people that preparedness is appropriate for people of all points of view, ages, religions, locations, etc. My intellectual roots are in the “back to the land” era of the late 60s and early 70s. That was such an exciting time of seeking alternatives, and I never lost that point of view. I find that much of the survivalist and prepper (preparedness) literature has a different mindset than mine, partly a generational thing perhaps, with roots in the military thinking of the more recent wars. For example, virtually everything I see about the SHTF (as in “when the s*** hits the fan”) assumes that you will want to be protecting yourself from your community. But I recently read a book that describes people’s generosity and warmheartedness in times of crisis. I haven’t reviewed it yet but you can see it here: A Paradise Built in Hell: The Extraordinary Communities that Arise in Disaster. I was inspired by a woman who started a soup kitchen in San Francisco in 1906 and many others. So going forward, I will be writing about simple green living, but it will be simple green resilient living! In other words, nobody knows what the future will bring… but let’s prepare (to whatever degree we can or choose to) for a variety of scenarios, and let’s do whatever we can to make it a better world.